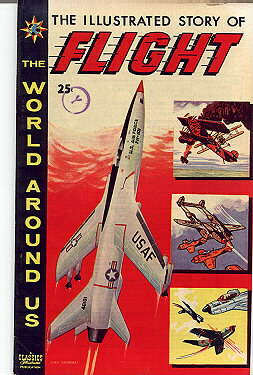 Classics Illustrated, The World Around Us, 'The Illustrated Story of Flight', April 1959, issue number 8, in Very Fine Plus (VF) condition. Beautiful like-new copy of this hard to find series just like it was first printed except for some very slight age discoloration around the edges! 'The World Around Us' series was only printed in limited editions between 1959 and 1961! If you could find it, this copy normally would sell for 75.00 or more in this condition. Free Priority Mail shipping and insurance charges for this item in the U.S.